Sony has been quietly developing a 13.3 inch e-Reader that is specialized for reading and editing PDF Files via a Stylus. The company has announced today on their Japanese website that they intend on commercially releasing it in Japan this December for $1100 US. The move to sell it in Japan first is due to a trial that five Universities engaged in to test the feasibility of the product in an academic setting. The first time Sony had displayed this product publically was at the e Ink booth at SID Display Week in Vancouver. Not only is this the first 13.3 inch e-reader in the world, but the screen technology was developed by Sony, called Mobius. This is a flexible high resolution e-paper display screen that makes it lighter and more durable. e Ink told us that the major benefit of Mobius is that the tech allows them to cut it to any size they want, and still retain all of the benefits. The new Sony e-Reader 13.3 will be known as the Digital paper “DPT-S1.” The PDF experience is the main attraction of this device, obviously you can take notes and make annotations by either writing with the stylus or the full virtual keyboard. If you make a note, you can save that page as an independent file. If you have a big PDF document and make all sorts of edits, you can save it as a “Workspace” into its own PDF document. This insures you have your virgin file, with no edits and then your changed document with all of your notes. If you have a large document with many notes, you can actually initiate a new feature that will allow you to look up all of the notes or changes you made on the document. A search feature will bring up a list on the right hand side, listing every single change you have ever made. If you tap on any of them, the page will open. 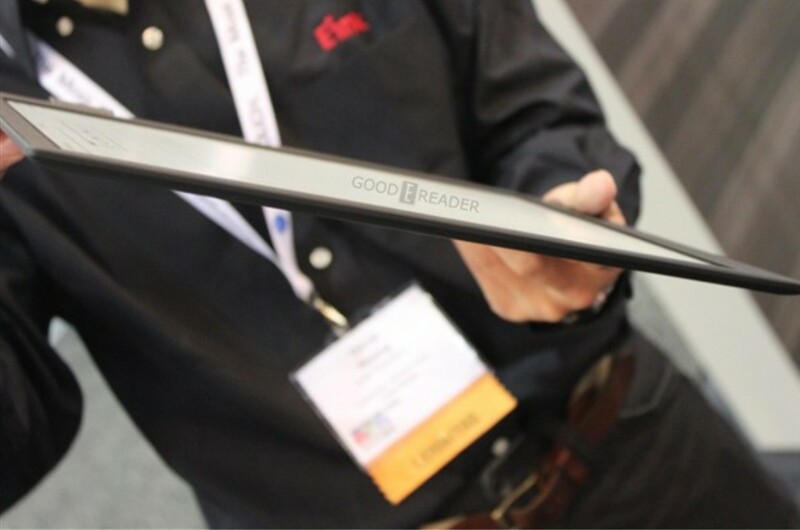 When we reviewed the e-Reader at SID Display Week it did not have support for EPUB books, just PDF Files. Sony has confirmed today that the e-reader will ONLY support PDF files, so you won’t be able to read your normal eBooks on it, unless you use a 3rd party program to convert your books from one format to another. Finally, Sony intends to launch this in Japan first, but plans on doing an international rollout in April 2014 to Canada and Europe. They are trying to market it to schools and businesses that can push out documents from a centralized server right to the e-readers via WIFI. Not excellent news, but it is something. This price is just an estimate, I hope it comes down to at least $700… If they want the universities market, they should make promotions or something like that to drop the price. As a student, I was really eager to get this device, but now I’m going to think twice before buying it at this price (most likely not going to buy it). They really have to do a perfect job to convince me. Either that or lower the price. I was also disappointed with the late release in other countries. I just hope that they do a market study and really think about the price. It’s just way to expensive. For that price, I’d rather just get a 13″ hybrid, or yoga, or something like that. Any information on U.S. release? An e reader for $1100? way way too expensive. definitely room in this segment for other manufacturers to vitalize competition. 13.3 is a lot of screen estate for sure and the device might be convincing but i don’t see me ever being able to afford such an expensive reading device, i’d rather spend that cash on content. Proper large screen and cost are imo the only relevant features in a PDF reader. Take away those awesome features like pen input, touch screen, or do what ever else needs to be done to get the cost down to $300. Wouldn’t that make most people on this thread customers? How much does it cost them to make a large screen? Yeah, i mean it is pricy. You can buy the MS Surface 2 PRO for that, or like many other things. I don’t know how well it will do if it can’t even read EPUB, which Sony Store sells eBooks as. it shows a server pushing the same document to an entire classroom, very useful. Right 10 million is certainly a lot, haha. Thanks for replying to our comments Michael, really cool! It’s way too expensive for students and even for schools. The only way would be grant from EU (you know how we hate EU wasting our tax money). I hope some other company will release similar device at half the cost. Also I would like dropbox instead of some sony reinvention. Price is too high because main target for such device should be students. The stylus input is one of the main features that can atract customers of the academic field. Removing it would be nonsense, because this tends to be a substitution of convencional paper, which allows us to write on it. I understand the costs, but they could make some deals, arrangements, like some kind of temporary (6, 12 or 24 months) fidelization to some service Sony provided. In that way they should manage to get a lower price without having loss. Still, I agree that they have some good ideas towards this device. Trough wi-fi you can download files from the dropbox to the reader. I think it won’t be a problem. Not *anything* for sure. I hope it will be somewhat cheaper when released in Europe. Some €650-700 seems like a reasonable price for this device. Not €1100, which equals to a gaming laptop almost. I agree with André, this device is clearly geared towards the academic use. The whole point for me would be to able to make notations and still keep all my documents in the electronic form. No device has been able to do that in a convenient way up until now. A conventional tablet pc is no comparison. To be fair, they would have a huge market if they knew who their audience was. For example, the music world would gobble this up IF they closed deals for sheet music on such a device. Can i just suggest you all á budget friendly tip? Cybook Ocean, wait for the review on Goodereader because it don’t have E-ink screen (another type of paper-screen that seems really good with contrast ratios) but it does have a student-friendly price tag and a big screen. 8″ inch, 1024 x 800 resolution something (all though it is not the best, it is the same PPI as sony and you still get better SPACE to read than other 6″ devices with the same resolution. This is due to the many, MANY, many pdf-functions the Ocean offers. Like zoom by any percentage you might think of, if i got it correct. I am not prompting everyone to buy it, just myself am very interested in buying it at the end of the month at release, shipping to Sweden. Linux operated, 8″ and huge pdf-capabillites makes this perfect for serving pdf-reading when i am not reading my physical chemistry, physic and math books hard-papered back.I will not wait for the sony to release in “april” or june or whenever they push it to next year. I am buying the Cybook with “OED” technique that has great contrast ratio that is equal/better than E-ink. I don’t longer care for “the real thing” when i read the price of this device i have longing for an entire 6month unncessary. Waste of time.. So this comment is just my 5 cents on what options you can take, if you need PDF functions and a bigger screen. I agree (who doesn’t? ): This is simply too expensive. If “DPT-S1″ will be sold for that price, it’s time to look for alternatives… Also: given that “the major benefit of Mobius is that the tech allows them to cut it to any size they want, and still retain all of the benefits” is there any news about possible ereaders with screen sizes 10” and up and (sold for much less!) Onyx M96 is on the way (9.7”), but a 11” one would be preferable for some folks. I’d like the price to come down a bit, but I’ll pay this price if I have to. I’m willing to put my money where I spend the bulk of my time. The interactive features are less important to me than the screen size. If the price of A4 Mobius would be €300/$350 I would buy 5 of them. What would you buy it for? Please let me know. Yes, this is probably too expensive for most. But a number of people, myself included, have been praying that someone would create a device aimed at academics who need the ability to annotate on eye-strain friendly e-ink. So bravo Sony! And if you can get the price down, great. But I’d still happily find a way to purchase this at $1100 and gimped to only work with PDFs. Hello, guys. Do you know if the software that runs in the device has the option to store your books + anotations in the cloud like Amazon does? I mean, if my device break, I would let not to lose my pdf’s and anotations. No, sony is not the solo one, onyx plans the same device for Q2 next year with a little bit fordable price. onyx maybe will help you in next year, but “at half the cost”, you asked really too much. Man, why can Sony not launch it in Europe? >_< I want one! I want big screens. I do not care about weight as long as it is under 6 kg or 14 pounds. Gimme, gimme big screens!